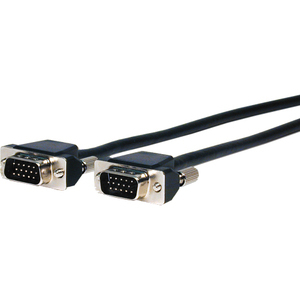 Comprehensive Pro AV/IT Series Micro HD15 VGA cables are perfect for those tight spaces where a full size HD15 connector would be too large. These micro HD15 male to female cables are true high resolution construction with three individually 95% shielded coaxes for maximum signal transfer and high resolution video and graphics. The entire cable is then 100% shielded with a foil shield to eliminate EM and RF interference, even over long distances. Comprehensive goes the extra mile with machined pins which ensures the strength of each pin, to make sure they do not bend or break as imitation cables often do. Comprehensive Pro AV/IT series cables provide thousands of connections and a lifetime of worry free use. Five True 75 Ohm impedance matched BNC connectors provide breakout of the component signal. UL and RoHS compliant. Lifetime Warranty. When it has to work, it has to be Comprehensive!